SimCity and I have had a sporadic relationship over the years. Before this latest iteration, I recall playing SimCity 3000 and, being 13 at the time, finding it too complex not be overwhelmed. Yet there was something there that fascinated me. Even earlier than that, I recall playing the first entry in the series on my NES and laughing maniacally as Bowser came through and stomped down all of my handiwork. I know now that what fascinated me was the creation, the simulation, of something I would never lay hands on in my real life. That same creationist quality is back in this year’s SimCity, evolving and pulsing with thoroughfare-based progression, and I’m finally old enough to sink into the strategy of it all. The result is a game which steals hours like it does Simoleans, and if you’re not careful, will keep you building long hours into the night. For those of you afraid of Origin, let me take a moment to assuage your fears. Origin doesn’t intrude on gameplay but enhances it through an integrated friends list and messaging. The server issues you’ve heard about are largely gone and in the entire scope of this review I only experienced one issue: my server being full a day after the more servers were opened up. While we could argue the merits of online gameplay, EA and Maxis have made it clear that offline isn’t in the works, so we are best to take the game as it stands, which remains an accomplishment. Gameplay follows the expected model but features a robust tutorial that introduces basic gameplay elements before allowing you to venture into un-paved ground. The learning doesn’t stop there, however. As you lay roads and explore the potential your region, advisors pop up offering suggestions and additional lessons to deepen the possibilities of your city. Since these come as a result of gameplay, expect to make some mistakes and, if you’re anything like me, to have your second city be much better planned than your first. When you begin, you will lay roads and zone for residential, commercial, or industrial development. Rather than having you place individual buildings like past games, construction happens automatically. I was taken back by this at first since I had hoped for a greater degree of business control, but it soon becomes apparent that SimCity wants to concern with its larger game over incidental planning. Rather than worrying where you’ll place your fast food chain, you’ll be adjusting taxes, developing industry, guiding mass transit, and making sure your citizens have plenty of entertainment to keep them happy. You’ll be worried about clean air and water, sewage flow, and how to provide enough electricity to keep the lights on. You’ll also be managing city services like law enforcement and fire, and making sure that each evolves alongside your city. Care must also be taken to maintain a delicate balance between workers and jobs, bulldozing buildings when it inevitably goes awry, and praying a zombie outbreak doesn’t happen as the plates wobble perilously upon their rods. The progression system is interesting if a bit slow, but also results in a drip-feed of rewards which keep you coming back for more. Buildings begin small, like any little town, but as the amount of residents increase and roads are expanded to accommodate greater traffic, they evolve into complexes and full-on high rises. Every action you take has a reaction. When it’s positive, you’re encouraged to keep on developing and open up the next build tier or answer growing zone demands. When it’s negative you risk driving residents away, such as placing a nuclear power plant in the middle of a residential district. (In my defense, it was temporary, but my sims didn’t seem to forgive me… this is what we do to keep the lights on, people). Just when you think things are done, another problem arises. SimCity is designed for inter-reliance. No one city can do it all and so multiplayer, or single-player region play, becomes an important evolution of the franchise. With regretfully smaller city limits than past games, each mayor will eventually hit a wall providing for their citizens wants and needs. Rather than bulldoze and rebuild, he can enter the global market and request resources from neighboring cities. Multiplayer shines in this regard, because each city will only reach its highest potential when mayors consider the region rather than solely themselves. In other words, when multiplayer games are taken as shared undertakings rather than quiet, side-by-side mini-games, the potential explodes outwards. 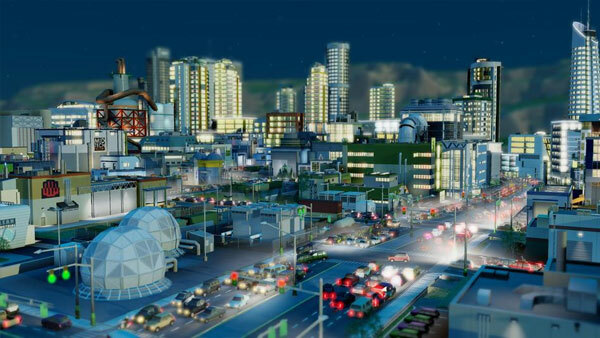 Entering into a multiplayer game with a surplus of industrial cities might drive a new player to develop their own with an emphasis on gambling. If another player comes in and sees a need for water services or fire coverage, they would be wise to place additional water towers and buy extra fire trucks. It is very much a give and take and forces the player to think larger than ever before. This all ties into the new specialization system. Once a mayor has laid the groundwork, they can choose to differentiate their city in one of a number of ways. Each plot features natural resources, so one rich in coal might decide to specialize in coal mining. Another along the seashore might decide to become a tourist hot spot. Specializing a city adds to the strategic side of gameplay by opening up a number of new development options and objectives. It also reinforces cross-city play. When cities within a region work together, they also unlock Great Works sites. These are massive undertakings requiring great amounts of money and resources for all involved. It’s delightfully rewarding to see your first work go up and know that it is one of the game’s great milestones. Building them also rewards the connected cities with development bonuses to tourism, education, and more, so it’s worthwhile to invest in their creation. 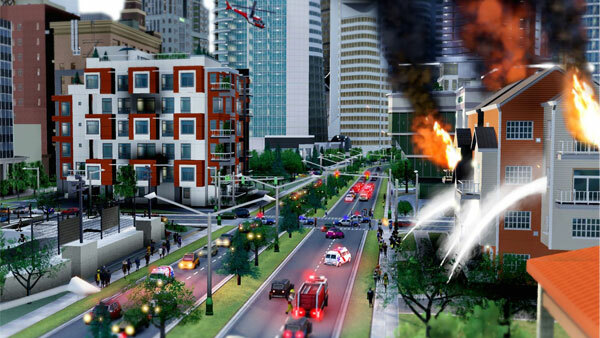 SimCity is also a visual and informational feast. You can zoom into street level or pan outwards to view a whole region. Changing the angle or zooming in provides a delightful cinematic motion blur. Buildings also construct in stages, so you’ll see them progress from the foundations, to scaffolds, to full buildings and then grow through their natural building progression as conditions allow. If you’re into data maps, the game also offers a number of overlays so you can see information flow by the building. Each Sim also has its own life and many will share their thoughts and concerns as cities progress giving a sense of life and activity fresh to the franchise. While the game is a lot of fun, there are still a number issues that need to be addressed. Advancements have been made with the traffic system, but it’s still not perfect. Lots of bugs remain, both graphical and functional. To their credit, Maxis is doing a good job of addressing these, but some of them can have a profound impact on the game’s functionality. Certain buildings can stop working, city systems such as water and electricity can break down and not deliver correctly, and trading between cities is still iffy. That said, many of these will go un-noticed by all but the most attentive players. More noticeable is the inability to keep a city truly happy. While it may mimic real life and so be classified as part of the sim, it’s a bit disheartening to see a flurry of red faces when your response was to a previous flurry of red faces. Also, where is the undo button? This, to me, is one of the true downsides to the online functionality. It’s terribly frustrating to misplace an expensive structure and have to chalk it up to a loss because of a simple miss-click. 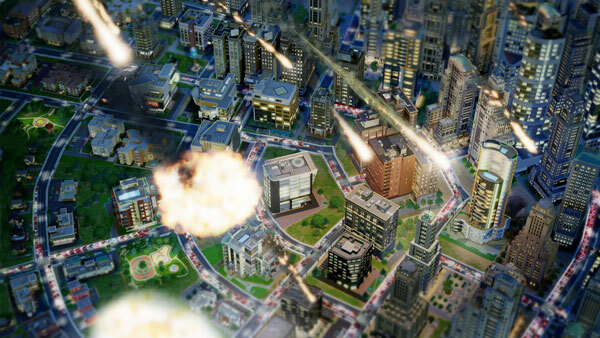 Overall, SimCity is still well worth the cost of entry. Before sitting down with it, the proverbial example of looking up to find three hours gone had been all but make believe to me. Here, however, it happened twice in a single week. The game has a way of drawing you in for “one more building” or “one more expansion,” while making you forget that each leads to the next, and the next, and the next. Is it perfect? No, that much should be clear after the last few week’s fallout. Thankfully a game doesn’t need to be perfect to be stellar. 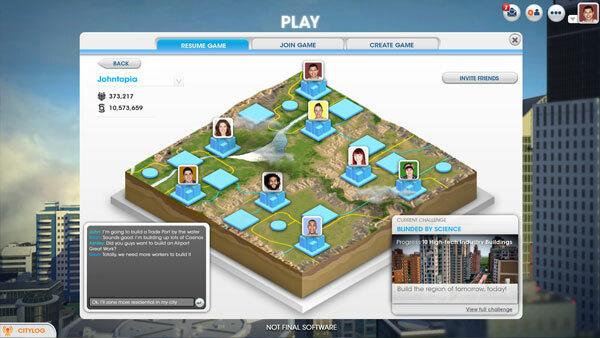 If you have a reliable internet connection and enjoy city builders, SimCity provides hours of entertainment both with friends and without. Great post Chris! I’m also a huge fan of SimCity, so this iteration is a bit disappointing with all the hiccups (to understate) that EA has been having with it. Actually, I recently picked up a copy of SimCity on the SNES (You wrote NES in your post! SimCity wasn’t on NES Sir :P) for 99 cents. Once all the public outcry of horrible server problems dies down, I may actually have to check this game out for myself. Decent Help and advice, thanks. Designed for folk who just plan to slim down in a hurry, look at our website for the best process to get rid of weight problems very easily. Useful Details, thanks much. For guys who just want to experience weight loss almost immediately, attempt our website for the most excellent means by which to melt fat at a fast rate. We supply cheap Bitcoin miners with same day shipping. Go to: % POSTURL %.